After having worked together on films like “Winners and Sinners” and “Project A” (both in 1983) Jackie Chan, Yuen Biao and Sammo Hung would team up again for “Wheels on Meals”. 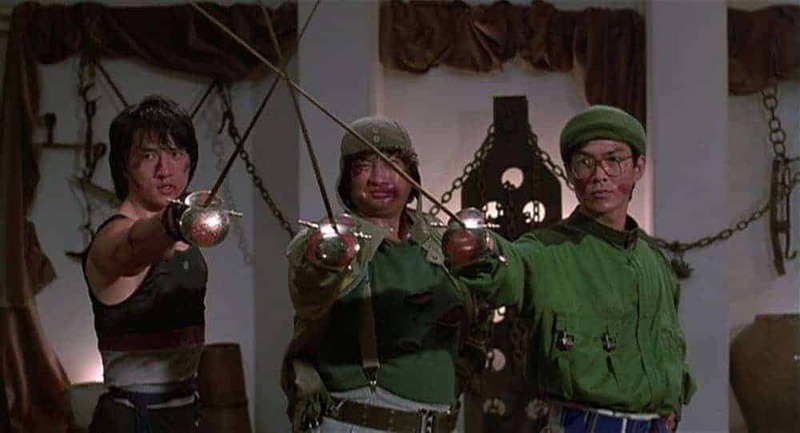 All three of them had reached a peak in their careers and the success which would follow the release of “Wheels on Meals” confirmed the great chemistry between the three actors, but also the potential in the unique blend of martial arts and comedy. However, by the time Sammo Hung was planning the film, he had to take into account the popularity of himself as well as Chan’s and Biao’s. According to the audio commentary, shooting in China had become somewhat impossible because of that, while the chance of receiving a permit to shoot was another obstacle for the production. Even though he neither spoke English or Spanish very well, Hung eventually decided to take the production to Barcelona, Spain after having considered many other options. In an interview about the film, he states how “Wheels on Meals” should introduce a new setting for this particular kind of film, a new urban setting along with the beautiful European architecture and landscape. Thomas (Jackie Chan) and his cousin David (Yuen Biao) run a successful fast food van in the city of Barcelona. Both trained in martial arts, they have come managed to come up with a unique routine for their job: while David prepares the meals Thomas delivers food and drink to their customers riding a skateboard. As they visit David’s father (Paul Chang), who is a patient in a mental asylum, they get to know Sylvia (Lola Forner), a beautiful young woman related to the girlfriend of David’s father. One night, David and Thomas run into Sylvia again as she is chased by several men. They soon find out these men are not the only ones looking for her, since their mutual friend Moby (Sammo Hung), a wannabe detective, is also after her wanting to complete an investigation for a client. Even though they manage to get rid of the men for now, Sylvia is still in great danger and if they want to find out the reason why and defend her, Moby, Thomas and David will have to team up. Generally speaking, “Wheels on Meals” might just be the most entertaining entry in the mixture of action and comedy which became the trademark of the film’s main actors. In one of the typical scenes of the film, the two cousins deliver dish after dish to several tourists, street artists and vendors in a large square, all of which done in rapid pace thanks to Thomas being on a skateboard. Even though not everything goes as planned – one painter accidentally puts his brush inside a filled cup of coke – the slapstick in the scene, along with the skilled routine is edited quite smoothly, drawing a detailed image of the characters. Their cooking, as well as their skills in martial arts creates the right mixture of skill, silliness and clumsiness, making Thomas and David somewhat naive maybe, but also very likable central characters. Perhaps the best way to illustrate their camaraderie and bond is shown in the opening montage. As they wake up in the morning, the image indicates a wall dividing each room, a visual deception revealed when Jackie Chan’s character crosses over to his cousin’s room. Along with the sparring match between the two of them, we can see their sense of fairness, but also their knowledge of the other person, indicating their respect for each other, but also their skills being on the same level. However, visual deceptions are used quite frequently within the movie, often with an ironic twist; for example, when Sammo Hung’s character takes his new role as private eye very seriously dressing up in a fancy suit which makes him look like he is about to attend a funeral. Although he is apparently confused by others commenting on his appearance, he still takes his new role quiet seriously. One of the trademarks of the film, along with the action- and slapstick-scenes, has to be the setting. Besides landmarks such as La Sagrada Familia or the Arc de Triomf, the European setting gives “Wheels on Meals” a fresh look compared to other martial arts films. At the same time, the Chinese characters of the film feel somewhat misplaced occasionally, an aspect which highlights their efforts to blend within the crowd. While their looks and their language give away their cultural heritage, characters like David, Thomas and Moby have managed to find a balance between their origin and the new environment they are in. Just like the scene mentioned before, not every move might be successful, but the overall image reveals them as characters who would fit in anywhere in the world. In the end, “Wheels on Meals” is a very entertaining film with the known mixture of martial arts and comedy. With a great cast, a wonderful setting and brilliantly edited action/fight-scenes, “Wheels on Meals” is a classic within the body of work of the three leads. Newly released in 2K as part of the Eureka! Classics-series, this is a must-have for fans of martial arts and good entertainment.